The new lighting system installed by Maritz Electrical at the Coetzenburg Athletics Stadium. When it comes to athletics in South Africa, few will dispute that Coetzenburg Athletics Stadium, at University of Stellenbosch, is a firm favourite. A preferred stadium for athletes around the world, for both training in their off-season before world championship events kick-off and to compete, this stadium has just been upgraded to include a state-of-the-art lighting system, the first of its kind at an athletics stadium in South Africa. Coetzenburg Athletics Stadium is owned by the University of Stellenbosch and is just over 10 years old. The track has seen Olympic Gold Medal winners and world champions train and compete over the years. The upgrade of the lighting system coincides with the upgrading of the track and facilities. Sports stadium lighting specialists, Maritz Electrical, recently installed a similar system at St George’s Park Cricket Ground, and was commissioned to install an LED lighting system that brings a new dimension to athletics stadium lighting at Coetzenburg. The lighting system is the world-renowned Musco system used in famous stadiums like Twickenham rugby stadium, numerous Formula 1 race tracks, Arsenal’s Emirates Stadium, among other world stadiums including St George’s Park Cricket Ground and now Coetzenburg Athletics Stadium too, by Maritz Electrical. According to Warren Williams, Head of Technical at Maritz Electrical, this is the first LED system installed at an athletics stadium in South Africa. The University of Stellenbosch recognised the need to upgrade Coetzenburg stadium to international standards to cater for global athletes using the stadium as a preferred training ground, and for international athletics competitions. Installation of the masts takes precise planning from an advanced Musco computerised set-up to ensure that, once installed, all areas of the track and field are sufficiently lit to the required lux levels. The demand from athletes and broadcasters to have cutting-edge tracks has resulted in stadium upgrades that include lighting at the right lux levels for high definition broadcasting, and to enhance spectator experience and athlete performance. Williams says, “This is a result of years of planning ending in an exciting installation in December 2018. The Musco installation comprises 5 masts, each with a predetermined number of lights, and lighting installed along the main grandstand roof. Each of the lights on the masts have been positioned precisely to produce lux levels suitable for high definition broadcasting. Lux levels achieved: 850 lux on the track, and 500 lux on the field, which is sufficient to allow for modern day television cameras. A total of 128 Musco fixtures have been installed around the track; 107 Musco TLC LED 1150 (1150 W) are installed on the 5 masts and 21 Musco TLC LED 600 (580 W) roof mounts on the main grandstand. Three of the masts were specifically designed to accommodate Vodacom, MTN and Cell C antennae and equipment. The lighting system is controlled by Musco’s multi-watt function, which allows for the lighting to be dimmed or set to three different levels 30%, 50% and 100% of power. The installation at Coetzenburg stadium has a 10-year warrantee on the lights, vastly reducing maintenance costs for the university. The installation of new lighting on top of the stadium upgrade, adds immense value to the university’s property. Maties is a university that attracts top students due to its quality of education and superior sports and cultural facilities. Coetzenburg offers students state-of-the-art facilities for local and international students and athletes, a significant boost to the property’s investment value. The stadium is popular for international athletes during their off-season training. During installation, Germany, Spain, Hungary among other teams were training at the track. Varsity athletics is a key source of South African athletics and with the stadium revamp including the track, facilities and lighting, Coetzenburg has just elevated itself into the country’s premier athletics venue, cementing its status as a preferred track. Williams says the new system takes athletics in South Africa to a new level. Not only is Coetzenburg the first athletics track to feature an LED system, it is the first of its kind at an athletics stadium in South Africa, leading the sport while conforming to international standards. This maintains the university’s status as one of the best in the world; a venue for all athletics up to and including senior and international competitions. 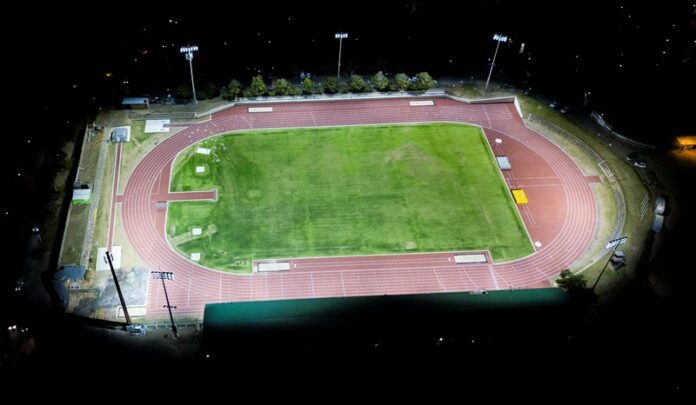 For more information on the new lighting system installed at Coetzenburg Athletics Stadium, contact Maritz Electrical on 021 703 0867 or email info@maritzelectrical.co.za.